Museum of Design Atlanta occupies the ground floor of a building artfully restored by Perkins+Will, one of Atlanta’s leading architectural firms that occupies upper levels in the same building. The museum moved in 2011 and is currently located in downtown Atlanta directly across the street from the High Museum of Art and The Woodruff Arts Center. 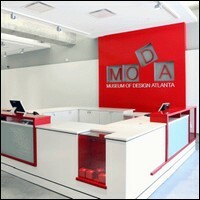 MODA is one of only a select group of museums in the United States devoted exclusively to design. Parking: Parking is available for a fee in parking garages located on Arts Center Way and at Colony Square, as well as one at the Promenade Building on 15th Street. Street parking is also available. MARTA: Exit the Arts Center Station and start walking north on Lombardy Way. Make a right at 16th Street, and turn right at Peachtree Street to reach the museum.